Dr. Jason Frischer is the director of the Peña Colorectal Center at Cincinnati Children’s Hospital Medical Center. His daughter, Elle, is a Sophomore at Timber Lake Camp and his son, Cal, will be participating in his first Rookie Day this summer. 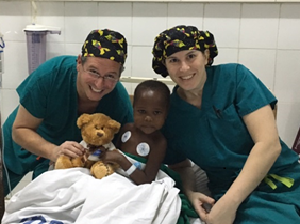 Over Thanksgiving, Jason led a medical mission to the Bugando Medical Centre in Mwanza, Tanzania. The surgical team was sponsored by the non-profit organization, Mending Kids. The team volunteered their services to provide 15 children suffering from congenital colorectal malformations with life-changing surgeries & trained the local surgeon, Sister Massenga, a nun, to perform these surgeries in the future. As a result, many of these children who had previously been shunned and shamed for their conditions are now attending school for the first time. Mending Kids provides free surgeries to children across the world and empowers local medical communities through training and support. And to that end, Jason and his team will be returning to Tanzania again next year to train and mend more kids. Jason’s humanitarian work is closely aligned with the mission of the TLC Family of Camps Foundation – a not-for profit that is dedicated to promoting the health and welfare of children throughout the world. The Foundation is proud to help support Jason’s upcoming mission to Tanzania.